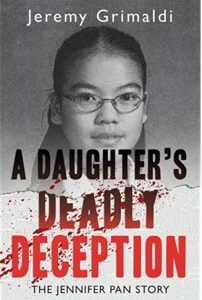 Look what I found when browsing through VPL’s eBook collection when I filtered for Available Now for some instant gratification – Jeremy Grimaldi’s 2016 title, A Daughter’s Deadly Deception: The Jennifer Pan Story. I didn’t have to look too far beyond the cover and the short library blurb about parenticide in Toronto, Canada in 2010 for me to sign it out. But then I felt guilty to be reading this lurid true-life tale. Does it say anything (at all) about me to read about a goody-two-shoes Chinese-Canadian woman (hey, I’m one) with a tough family relationship (been there) who plots to murder her parents? Really, no. Other people I’ve told are fascinated, too. And as punishment of sorts, when I started reading the book in the middle of the night and it begins with the home invasion and some black and white photos, I was completely terrified that the next photo would be graphic (it wasn’t). The first two parts of the book, were the “law & order” – Grimaldi describing in detail (but not too much) what detectives found as they went down the rabbit hole investigating Jennifer and her associates and their acquaintances. This is truly a modern crime with so much technological evidence at their fingertips from the traditional wiretaps to text messages, social media and tracking people’s movement down to the minute based on volumes and volumes of cell tower data. I was astonished by the personal details of Jennifer and her associates – multiple cell phones, burner phones under phony names and contacts stored under rotating handles. Her male associates had multiple girlfriends concurrently and would rotate living with them and using the girlfriends’ cellphones for their business as well. Some text message exchanges were provided that were colourful insertions serving as evidence of intent and a quick glimpse into the lifestyle. * It seemed too easy go from the fringe of a criminal lifestyle as Jennifer’s boyfriend seemed to rationalizing his actions and getting more involved in the name of raising enough money (dealing drugs) to buy a car. And of course that backfires. At the end of two parts, the verdict is delivered and it is somewhat unsatisfying because that is what happens when everyone has a changing story and either legitimately can’t get the facts straight when four years has past when the case goes to court or they are lying. I did not Google the case or anything so I hadn’t “spoiled myself” about the verdict. That is what happens when the two sides of the case can only present what is attractive to their case and we can’t truly get into the defendants’ minds to know. In the third and last part of the book, Grimaldi goes into the past and weaves his research into Asian-American/Canadian parenting and households to surmise Jennifer and her family’s experience. This was satisfying on another level. I had implicitly assumed Jennifer’s strict upbringing as the reason why she would contemplate harming her parents but the deception in the title was far more than I could imagine. Twenty years ago – a lifetime ago – I did my fair share of lying about boyfriends and my grades but I’m not nearly smart enough to pull off what she did for so long. The fact that she managed to keep up her biggest lie for six years while living with her parents is next-level manipulation – I had to leave the city where my parents live and still couldn’t keep my stories straight. My horror is not just regarding the events of that tragic night Jennifer Pan’s plan was executed but the unpredictable effects of parenting styles. My fear is two-fold from this empathy for parents mixed with fright where I could have ended up to fear about raising the next generation. It seems fraught with minefields, where the best intentions blow up in your face and you had done your best all along. With the conclusion their own futures are forgone, Jennifer’s parents – Han and Bich – poured their resources into their children. Grimaldi spelled out clearly why the Chinese put such an emphasis on education. Besides that it is a fairly equitable arena, in Confucian China, succeeding on the civil service exam that is open to anyone paves the path to becoming a scholar which comes with the opportunity to join the imperial service. Literally, scholarship and learning is the key to be free from the cycle of poverty (or peasantry). The musical instrument hierarchy: “Cultural pursuits, for many Asians, have their own hierarchies – violin and piano are at the top, percussion instruments – which at least one author says her parents implied might lead to drug use” – that is why I was never encourage to train vocally, what a poor man’s endeavour that doesn’t require an instrument, is to uncouth you are contorting yourself to create music!! One former classmate characterized Jennifer as so: “I wouldn’t call her dour, but maybe sour. I never saw her as jovial or excited … openly happy or smiling about something … everything was serious.” That pretty much described how I saw myself. In the moment, I thought you might not be able to tell, but it was probably painfully obvious how unhappy I was, how wistful for the “other life” I was, despite being raised to not care. But the “other life” was one with pleasure and never approved for me so “this sort of pressure that prompts dishonesty, according to some researchers. For many children, especially girls, the easiest alternative is to pretend.” We know how frowned upon it is to deviate from the path set by our parents – they have more experiences, they repeatedly tell us how much they are sacrificing and doing it all for our good and future. Unfortunately, deviations from their prescribed path “can be construed as error or delinquency rather than individualism.” This serves strongly to reinforce the urge to maintain secrecy. This taught me something and took me out of my sheltered world. That is a good turn.